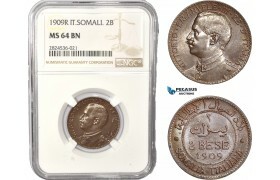 AC392, Italian Somaliland, Vittorio Manuele III, Pattern 1 Besa 1909-R, Rome, NGC PF65RB, Pop 2/0, Rare! AC392, Italian Somaliland, Vittorio Manuele III, Pattern 1 Besa 1909-R, Rome, NGC PF65RB, Pop 2/0, R..
AC393, Italian Somaliland, Vittorio Manuele III, 2 Bese 1909-R, Rome, NGC MS64BN, Pop 2/0 ..
AC394, Italian Somaliland, Vittorio Manuele III, 2 Bese 1921-R, Rome, NGC MS64BN, Pop 1/0 ..
AC395, Italian Somaliland, Vittorio Manuele III, 2 Bese 1924-R, Rome, NGC MS65BN, Pop 1/0 ..
AC990, Italian Somaliland, Vitt. 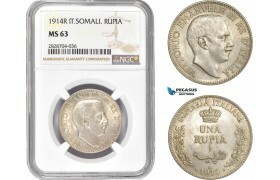 Emanuele III, Rupia 1914-R, Rome, Silver, NGC MS63 ..
ZI59, Italian Somaliland, Vit. 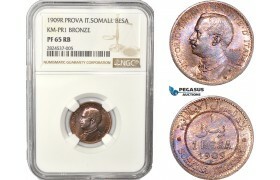 Emanuele III, 4 Bese 1924-R, Rome, NGC MS65BN, Pop 1/0, Finest! Rare! 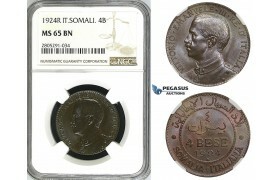 ZI59, Italian Somaliland, Vit. 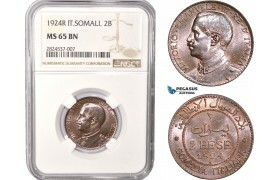 Emanuele III, 4 Bese 1924-R, Rome, NGC MS65BN, Pop 1/0, Finest! Rare!..